Shop wool rugs online and this handmade wool area rug in Mughal Noir design at best price. 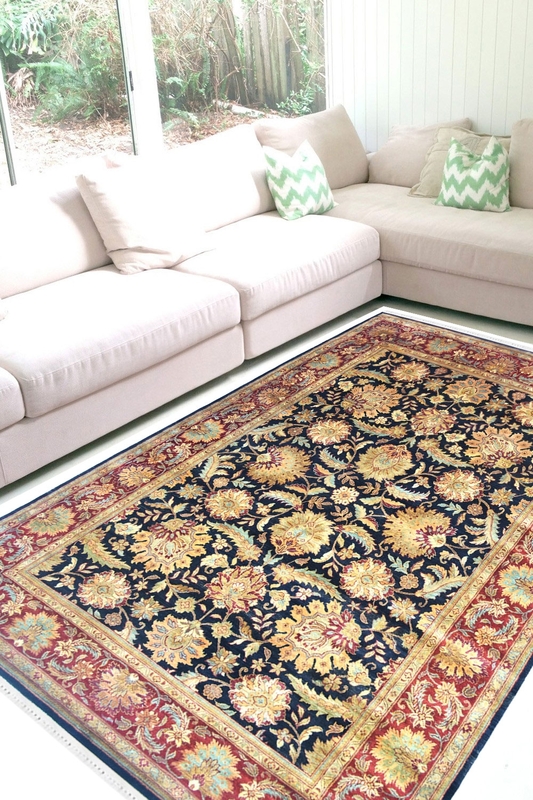 One of a kind Mughal Design Rug and is Hand-knotted in 100% Pure New Zealand wool with intricate craftsmanship. Colors are very neutral and include Blue, gold and maroon. It is a perfect blend for today's interior design decor. Exclusive All Over Mughal Design Handmade rug. This is Pure 100% Wool Rug Handmade in New Zealand Wool. It contains " One of a kind" pattern rug and the design has been originated from the Mughal Era in late 16th and 17th Century. It has taken 8 months to weave it by our skilled artisans. This is a double Weft Rug and of Superior Quality. Primary Colors are Blue, gold, and maroon. It has a dark blue Background with maroon Layered Border. The gound is filled with golden Mughal motifs. Perfect as a Passage Rug in the Hallway or a living room. The Design is extremely intricate and the Rug can easily be vacuumed in the direction of the pile.